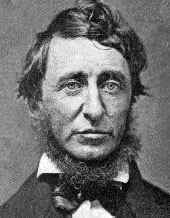 Henry David Thoreau was born on July 12, 1817, in Concord, Massachusetts. He attended Harvard from 1833 to 1837. He had a complete fascination with the natural world and great literature in general. Life seemed to him to be a playground of thoughts. He draws from a great volume of understanding and his thirst for information seems unquenchable. If you have read or listened to The Iliad and The Odyssey, you will especially enjoy some of his references. He also weaves verses from the Bible into his writing in an interesting way and you will appreciate his writing more if you have a basic understanding of Homer, Shakespeare, Plato, Chaucer, John Milton, Alexander Pope and Emerson. Within this book you will meet a man of independent thought who is completely consumed with the sheer delight of discovery. To wander in the woods in solitary thought was a spiritual experience. He was also involved in a philosophical and literary movement which flourished in New England from 1835 to 1860. Both he and Ralph Waldo Emerson were at the center of transcendentalism and influential in American thought and literature. Thoreau’s thoughts flow from one subject to the other throughout this book. The contents include Walden, A Week on the Concord and Merrimack Rivers, Cape Cod, The Allegash and East Branch, Walking, Civil Disobedience, Slavery in Massachusetts, A Plea for Captain John Brown and Life Without Principle. Walden – Walden represents our ability to follow our individual dreams all while being willing to be satisfied with less in order to gain greater intellectual freedom. 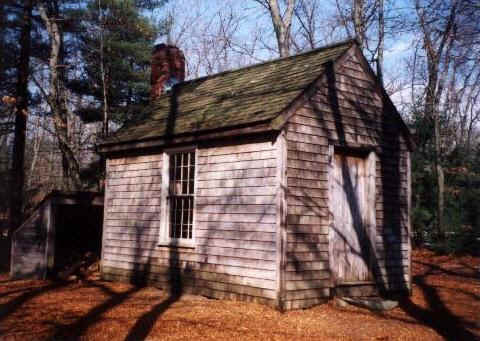 Thoreau built himself a cabin on the edge of Walden Pond and lived there from 1845 to 1847. During this time he supported himself by surveying and growing vegetables. He rambled about in the woods and collected his thoughts in detailed journals. His friendships seemed few and far between, however the friends did make seemed to turn into deeply satisfying relationships. Walden Pond becomes Thoreau’s lover. He drinks from her cool refreshment, swims in her enveloping waters, knows her every mood in summer or winter and observes her with the utmost attention as she freezes, melts and dances playfully in the sun. The descriptions of this pond are well-worth reading as he has a talent for capturing her very essence with his extensive vocabulary. A Week on the Concord and Merrimack Rivers – Thoreau and his brother made a river voyage in a boat they built. This experience was the basis for his first self-published book in 1849. One minute you are reading about the river and the next you enter an entirely different world of thought about friendship. 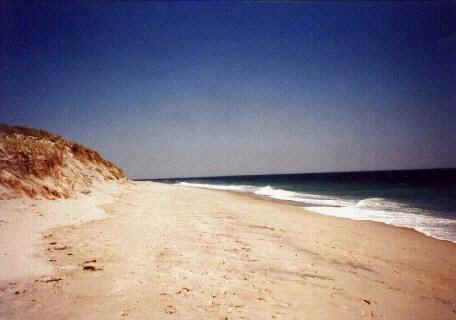 Cape Cod - Thoreau made the first of four trips to Cape Cod in 1849, and he later delivered lectures about his experiences. Allegash and East Branch – A journey made in 1857 with Edward Hoar and an Indian guide who brings some humor to the tale. Edward gets lost and we see a side of Thoreau that shows his concern for his fellow human beings. He is normally just so independent. Walking – Quite humorous at times and explains his love for walking and for letting the wildness in man come out to play. Civil Disobedience –This essay seems to have been born during the time Thoreau had to stay in a prison because he refused to pay a poll tax. This essay is said to have influenced Gandhi in India and the civil-rights movement led by Martin Luther King. Slavery in Massachusetts – A lecture given in 1854 at an Independence Day meeting of the American Anti-Slavery Society. A Plea for Captain John Brown - In October 1859 the abolitionist Capt. John Brown raided the federal arsenal at Harper's Ferry, and Thoreau spoke in defense of his character. Life Without Principle – Here he gives his views on rushing off to California in search of gold. This man’s mind was a deep forest and his descriptions of nature are quite inspiring. Where else would I have read about a whale’s vertebra being used as a mortar or been so highly entertained by his conversations with an eccentric elderly gentleman? There are also descriptions of shipwrecks and discussions about survival in the woods. Thoreau’s humor will often catch you unaware and if you collect quotes, you will find quite a few. Since most of us will never build our own homes, cook over a wood fire on a regular basis or take our baths in a pond, this book presents a lifestyle we may never experience. You will rarely find an individual in your own circle of friends who would encourage you to downsize your life in a super-size world. The uncommon perspective presented in 732 pages will appeal to writers, poets, philosophers and anyone who values their thoughts more than material possessions. During the week of reading this book, I was inspired to take a trip out to the mountains, walked along a river, and worked in my garden with a new sense of purpose. The world became a vibrant, new environment filled with possibilities. Intense reading? Yes. A week’s worth of reading will inspire you for a lifetime. If at all possible, read while this book while floating in a boat on a pond or while on a camping trip in the woods. Mary Whyte's art has been exhibited by art galleries and has been collected by museums. She is also the author of Watercolor for the Serious Beginner and has illustrated children's books. I think the reason people love her art is because of the spiritual elements she is able to capture in watercolor. She also adds a magical dimension with color, like she adds blue to the steam from the pan on a stove. The sky burns in a rosy orange as a beautiful woman holds sunflowers. What I love most about her paintings is the use of blue colors to warm the moments. She also has an expert eye for capturing reflections in water. Her "Moon Over the Meadow" makes you wish you were there, bathed in the blue silvery light. Mary Whyte's paintings are all beautiful expressions of detailed observation, but where she truly excels is when she paints beautiful women in fields of flowers. They are just stunning. The beauty of this book is not only the artwork; it is also in the poetic writing and artist comments. 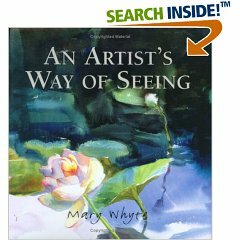 Like a diary of experience, Mary Whyte explores landscapes, discusses specific ways she captures moments and is a true teacher in the way she explains how you can create your own watercolor magic. An Artist's Way of Seeing is a true inspiration and rare find! Gordon Hayward's ideas can be incorporated into any style of garden. If you have a walkway to the front door or need to manage an especially large lawn, his ideas will create a beautiful nurturing space you will love coming home to. Each idea also has a special section of "Design Principles." 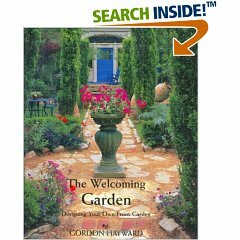 The author explains the pictures so you gain a sense of how a designer thinks when planning out a new yard. There are many ideas to love and there is a good balance of creativity and practical solutions.